Writing the Age of Aquarius made me review my take on Michael Cheika’s time in charge of Leinster and to revalue the impact he had on the province. Perhaps because his Heineken Cup triumph was linked in my mind to Brian O’Driscoll and Rocky Elsom both having great seasons, I missed a lot that was hidden in plain sight. I’m of the opinion that for all the tactical and technical input a coach has, his biggest impact is selection of a team. Cheika’s been prepared to tinker with his team in the lead up to the RWC which, if Australia were losing, would look like indecisiveness. Having secured the Rugby Championship including a well-timed win over NZ, it looks more like a gutsy decision to trust his instinct. Given his comments that “Because we have been changing players around, there is a bit of a thought that we don’t know who should be in the team. But I can assure you that we have been working off a plan that we have had since we came back from the Spring tour and I’m sticking to that plan.It’s been something that is working for us. We have improved in our depth and in a lot of the areas that we needed to improve on.”, it appears Cheika had heard comments about indecision himself. 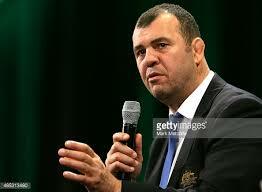 Two of the things that Cheika has done have been particularly impressive and in line with his reputation as an innovative risk-taker. Australia had a policy of not picking players who were based outside the country but Cheika argued his case and got the ARU to change their policy, something Deans and McKenzie never managed. Matt Giteau and Drew Mitchell have been selected and provide Australia with experience, a greater depth in their squad and an awareness of what it is like to play in the Northern Hemisphere as the temperature drops and the days grow short. The second thing Cheika has managed is not only to fit Michael Hooper and David Pocock in the same backrow but also retain Scott Fardy, his best lineout option. Aside from being excellent breakaway flankers, Hooper and Pocock have both captained Australia and provide the Wallabies with a solid leadership group. This looks like eminent sense in hindsight but very few people were clamouring for Pocock to play at number 8 before Cheika made his call. Further evidence of Cheika’s decisiveness was on display when he announced his squad and revealed that he’d included two hookers and two scrum halves, essentially freeing up two spots in his squad from the pro forma selection. His argument is that this selection provides “two clean teams, plus an extra front rower. We pretty much have two starting 15s there … two fresh teams and the ability to train against each other.” That’d be pretty useful for running opposition plays in training but I doubt any squad will have two fresh teams at any stage once the tournament starts and I believe that managing injuries will be central to success. Instead, what I was interested in was figuring out where he has used those two spots in order to get an insight into how Cheika will prepare for this tournament. I believe that the selection of Sean McMahon gives him three opensides, two eights (McCalman and Palu) and a blindside (Fardy) in his squad and that Pocock will start at eight against England as Australia seek to win the battle on the floor against an English team without a specialist. His other joker may prove to be Kurtley Beale, an extravagantly talented but occasionally troublesome attacking threat. Beale’s versatility means that Cheika can go with two back subs and use six forwards to replace three quarters of his pack. I think that McMahon could join Skelton and Palu on the bench to cover breakaway and add fresh legs in the last twenty. Cheika explained his decision to leave James Horwill at home by saying he was looking for for two locks who were “jump lineout-orientated” and two who were “work rate” ones. Skelton ain’t no lineout operator so that must put him in the work-rate camp. I find that a tough one to get my head around, locks like Paul O’Connell and Patricio Albacete are my idea of work rate locks, I think Skelton is a huge lock with good distribution skills. As we’ve alluded to before, you can’t coach being 140kgs. Cheika’s bench options may get only slightly more time than Mourinho’s ten minutes but that could make a lot of difference in the tournament’s toughest pool. The Aussies have a bunch of players capable of scoring tries in the backs but the requirement to go toe-to-toe against two big Northern Hemisphere teams and Fiji before the knock outs even start may have tilted his hand towards energising his pack with some tactical replacements. Where Australia look weak is place kicking. For all Giteau and Cooper’s vision and sleight of hand, they are inconsistent off the tee and I think Bernard Foley will land the spot as the main man providing he can kick his goals. This entry was posted in Mole's World Cup Diary and tagged David Pocock, Michael Cheika, Michael Hooper, Sean McMahon, Wallabies, Will Skelton by dementedmole. Bookmark the permalink. Agree with you about the lock selection. If Horwill’s play during the Rugby Championship wasn’t “work rate orientated,” I don’t know what was. Cheika’s hands were probably tied though as he fought to get Mumm and Douglas back from Europe, and Skelton has always been a favorite of his. Wouldn’t have looked good if he had left 1 or 2 of those guys at home. Skelton to be fair – offers a lot more ballast around the park than Horwell – and you need as much firepower as possible at a RWC. I think Cheika deliberately didn’t pick his strongest team for the 41-13 mauling in NZ – as they were bound to get pummeled the week after exposing some chinks in the armour – and he wants to keep something up his sleeve. Australia aren’t really talked about as contenders due to the monster group they’re in – but I think they could suprise a few. Think that’s it with Skelton, he is possibly exposable as he isn’t the most nimble guy, but he has a fairly obvious usp. He makes professional, massive rugby players look like kids at school playing with a kid a few years older. A bit like the famous billy vunipola photo. He’s a kind of a wild card pick who can give impact off the bench, or as the autumn kicks in could squeeze 50 mins from the start. He also counteracts the extreme mobility that pocock and hooper provide with a bit of…… errr…..extreme stability. This group is getting harder to call after the weekend. I had England as my favourites to win the whole thing, but am reassessing that now and am starting to think they are in trouble -wales can beat them this weekend and that would leave England needing a result against Australia who have looked in good order. The decisiveness and clarity which Cheika brings (and also gatland to be fair) as mentioned by the mole, may be a big advantage in a tournament like this. Bringing up vunipola again-was he serious that he didn’t know about the bonus point? Could be a joke, I dunno, but England didn’t play like they had much clarity in what they were trying to do. One last thing that I’ve been looking forward to, is who will take on mccaw’s mantle as the most influential and best 7/backrow/player in the world? And will it be during the World Cup or after it? I thought o’brien’s performance against the kiwis served notice of the end of his astonishing era, but he has battled on longer still. Warburton, hooper, o’brien, pocock, Kane/savea, brussouw (can’t believe he didn’t travel) , tipuric, or even Robshaw (in a different way to the rest). He mightn’t even play 7 in it, but this could become pocock’s tournament. They came 3rd four years ago. They are much better now. Ah, that should read Cane and should also read as: players who were/are potentially in a position to stake a claim. I really enjoyed the age of Aquarius article – it was one of your best mole. Leinster did well to get such a decisive selector to bring new blood in and then follow it up with someone who could develop that existing talent further. You really nailed the respective regimes and a lot more too.